Transportation in Amsterdam. Travelling within Amsterdam is easy and straight forward. There is an extensive transport network connecting city districts, which includes the train, tram, metro, bus and ferry. The primary airport is Schiphol – modern and efficient. A taxi to the vicinity of Leidseplein runs from 35 to 40 euro. Trains connect the airport with the city centre with tickets running about three euro each. Feel free to check our “Arrival at Schiphol Airport” video at the bottom of this article. It is important to remember that paper transport tickets are no longer available on public transit. PT Smart Cards (OV-chipkaart) allow unlimited travel throughout Amsterdam for 1-7 days. Ticket prices start at 7 euros. For more information on PT Smart Cards (OV-chipkaart), their denominations and where to purchase them as well as a metro map and maps of bus and tram routes, check out the GVB website. You can also find more information by checking our “Amsterdam Public Transport” at the bottom of this article. 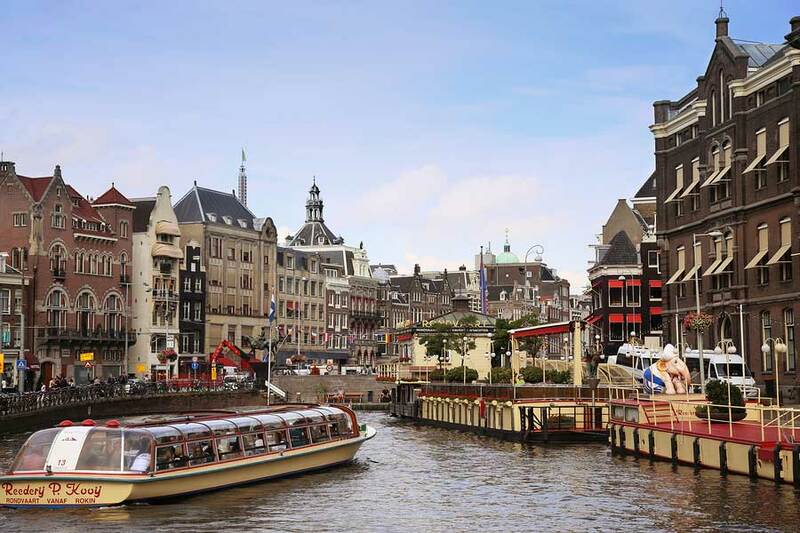 The I-Amsterdam City Card gives you unlimited use of the GVB public transport system for 24, 48 or 72 hours, in addition to entry to 37 museums and a round-trip canal ride. More information is available on the GVB website. If you are looking for a unique and relaxing way to get from point A to point B, ferries transport passengers from behind Central Station to destinations across the northern part of Amsterdam, completely free of charge. There are also some specialist ferries that travel along the river to other districts of Amsterdam. Using public transit in Amsterdam is simple, provided you follow the rules. When you start your journey, you must hold up your transit card to the card reader until a green light appears and you hear a beeping sound which indicates your card has been read properly. If you switch to another mode of transit you must first check out of your current mode of transit by holding your card up to the reader again, and then check in to the next mode of transit in the same way. It is important to remember to check in and check out, otherwise your card will be rendered invalid and you may face a fine. If you go, go by bike. For those looking to explore the city by bicycle, there are a multitude of bicycle rental companies, many of which offer multilingual booklets and maps to help you get orientated to the city, and cycle safely. Several of the bike rental locations offer discounts to I-Amsterdam City Card holders, included MacBike and Amsterbike, both of which offer a discount to card holders. Amsterbike, Piet Heinkade 11A, 1019 BR, tel. : +31 204 19 90 63. MacBike Rental, Weteringschans 2, 1017 SG, tel. : +31 206 20 09 85. Affectionately regarded as the “Venice of the North”, Amsterdam boasts over 100km of picturesque waterways, making it the perfect setting to explore by boat. Countless cruises are available to suit every discernible taste, from candle lit tours of the Red Light District to all you can eat pancake cruisers, however the Canal Bus offers a superb hop on hop off service that combines sightseeing with effective transportation. Providing a regular schedule that incorporates three distinctive routes and an impressive 17 stops, this relaxing and informative approach to discovering the city alleviates the stress of public transport, allowing you to glide past historical treasures and architectural triumphs and reach your destination in style. Book your tickets online to receive a discount or contact +31 206 23 98 86. Weteringschans 26-1, 1017 SG Amsterdam. Note: This information was accurate at time of posting. Please be sure to confirm details directly with the companies in question before planning your trip.